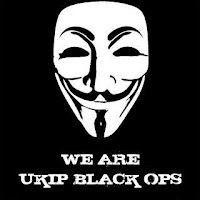 It takes a "special" kind of person to invent a shadowy group of anti-English (anti-English defined as not an English Democrats supporter) activists called "UKIP Black Ops" and it takes any even more "special" kind of person, having invented this group, to be able to convince themselves of its existence. Step (or stumble) forward Steve Uncles, chief fantasist at the English Democrats and 99 of the "100 writers" on the English Passport blog (the other one is the former BNP member, Eddy Butler, who Uncles recruited to the English Democrats last year). Deciphering the incoherent ramblings on his anti-UKIP hate blog, he seems to have invented "UKIP Black Ops" after a Christmas binge declaring his old enemy, the respected English nationalist and civic campaigner, Gareth Young a member of an anti-English, anti-English Democrats group in UKIP apparently in the pay of Nigel Farage. At some point, another UKIP member and prominent English nationalist, Jamie McCaffery, was also declared as a member of "UKIP Black Ops" and of course it was a natural progression for him to decide that I too am a member of "UKIP Black Ops" and in the pay of Nigel Farage. Jamie and Gareth found this most amusing and created a "UKIP Black Ops" badge of honour for their Facebook profile pictures. Uncles saw this as "evidence" that the group he made up just weeks ago is real and that Gareth (who Uncles describes as anti-English because he has a Welsh first name and Scottish surname, even though "Young" is of Anglo-Saxon origin!) has outed himself as its leader. It's a wonder the English Democrats aren't already running the country with this political genius in charge.